Go to original pattern for design DROPS 177-27. Knitted jumper with lace pattern in DROPS Air. Sizes S - XXXL. DROPS DOUBLE POINTED NEEDLES AND CIRCULAR NEEDLES (40+80 cm) SIZE 5 MM – or needles required so that 17 stitches and 22 rows of stocking stitch make 10 cm in width and 10 cm in height. 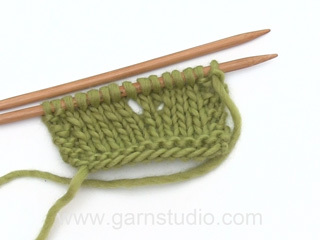 DROPS DOUBLE POINTED NEEDLES AND CIRCULAR NEEDLE (40 + 80 cm) SIZE 4 MM – for garter stitch borders. 1 ridge = 2 rounds. 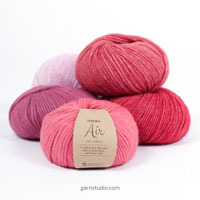 * knit 1 round and purl 1 round *, repeat from *-*. See diagrams A.1 to A.3. 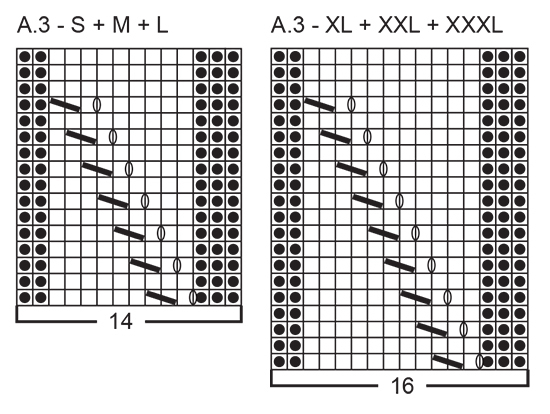 The diagrams show all rows in the pattern from the right side. Choose the diagram for your size. Start 2 stitches before the marker thread, make 1 yarn over, knit 4 (the marker thread sits in the middle of these 4 stitches), make 1 yarn over (= 2 stitches increased). 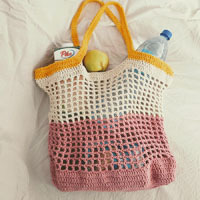 On the next row, work the yarn overs twisted knit so that there are no holes. The body is worked in the round on circular needle up to the armholes. 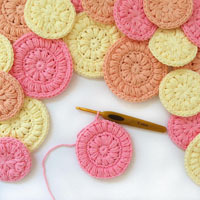 Then work the front and back pieces separately, back and forth on the circular needle. The sleeves are worked in the round on double pointed needles/short circular needle. Cast on 168-180-196-216-236-256 stitches with circular needle size 5 mm and Air. Change to circular needle size 4 mm and work 2 RIDGES - see description above. Change back to circular needle size 5 mm. Insert 1 marker thread at the beginning of the round and 1 marker thread after 84-90-98-108-118-128 stitches (= the sides). Work 1 round knit. The next round is worked as follows: 15-18-22-23-28-33 stitches stocking stitch, A.1 (= 14-14-14-16-16-16 stitches), A.2 (= 26-26-26-30-30-30 stitches), A.3 (= 14-14-14-16-16-16 stitches), work stocking stitch for the rest of the round. Continue the pattern in the same way and allow the marker threads to follow the work upwards. REMEMBER THE KNITTING TENSION! When the piece measures 35-36-37-38-39-40 cm cast off 6 stitches in each side for the armholes (3 stitches on each side of both marker threads). Front and back pieces are continued separately. = 78-84-92-102-112-122 stitches. 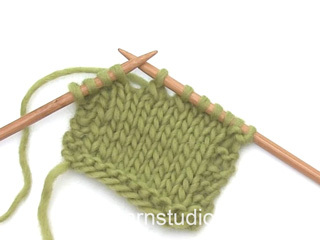 Continue with stocking stitch and cast off for the armhole at the beginning of each row in each side as follows: 3 stitches 0-0-0-1-1-2 times, 2 stitches 2-2-3-2-3-3 times and 1 stitch 1-2-3-3-4-4 times = 68-72-74-82-86-90 stitches. Continue working until the piece measures 52-54-56-58-60-62 cm. Now cast off the middle 28-28-30-30-32-32 stitches for the neck and each shoulder is finished separately. Continue with stocking stitch and cast off 1 stitch on the next row from the neck = 19-21-21-25-26-28 stitches left on the shoulder. Continue working until the piece measures 54-56-58-60-62-64 cm and then cast off. Work the other shoulder in the same way. = 78-84-92-102-112-122 stitches. Continue with the pattern as before and cast off for the armhole at the beginning of each row in each side in the same way as for the back piece = 68-72-74-82-86-90 stitches. 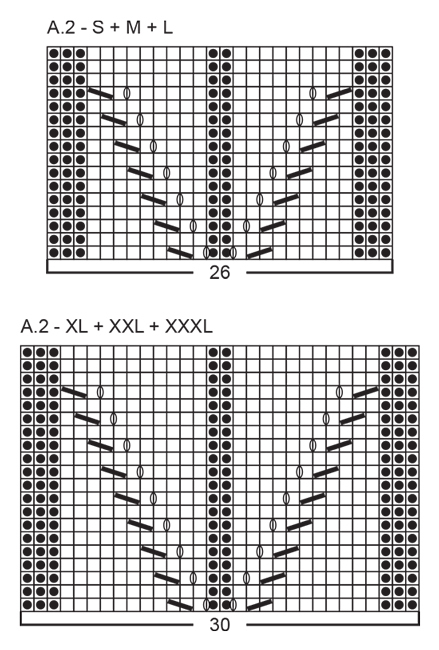 Continue working until the piece measures 48-50-52-52-54-56 cm. Now place the middle 22-22-22-22-20-20 stitches on a thread for the neck and each shoulder is worked separately. Continue the pattern as before and cast off at the beginning of each row from the neck as follows: 2 stitches 1-1-1-1-2-2 times and 1 stitch 2-2-3-3-3-3 times = 19-21-21-25-26-28 stitches left on the shoulder. Continue working until the piece measures 54-56-58-60-62-64 cm and then cast off. Work the other shoulder in the same way. 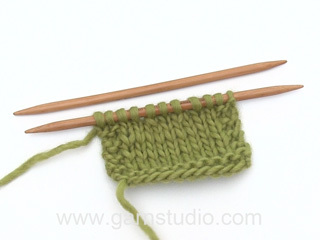 Cast on 34-36-38-38-40-42 stitches with double pointed needles size 5 mm and Air. Change to double pointed needles size 4 mm and work 2 RIDGES - see description above. Change back to double pointed needles size 5 mm. Insert 1 marker thread at the beginning of the round = mid underarm. Work in stocking stitch in the round. 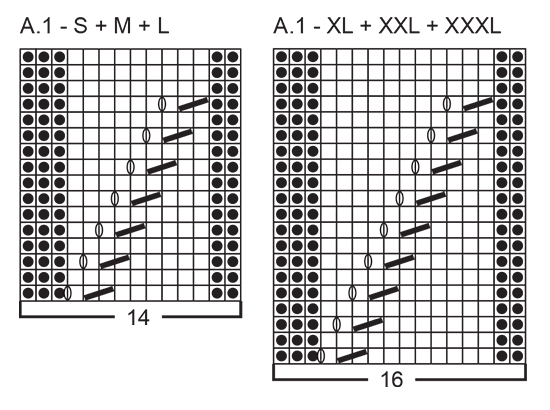 When the piece measures 10-8-8-8-6-10 cm increase 2 stitches mid underarm – READ INCREASE TIP. Increase in this way every 3-3-2½-2-2-1½cm in total 11-12-13-16-17-18 times = 56-60-64-70-74-78 stitches. 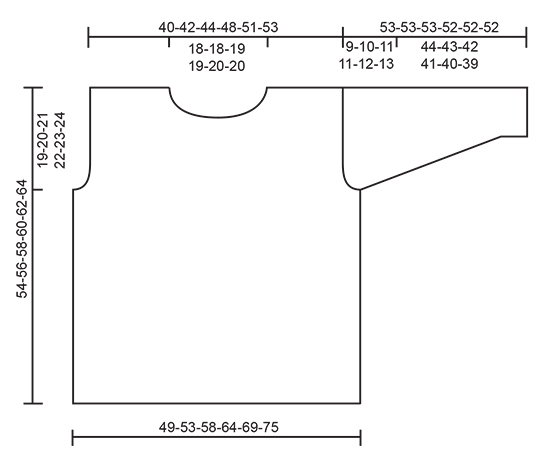 When the piece measures 44-43-42-41-40-39 cm (shorter measurements in the larger sizes due to broader shoulder width and longer sleeve cap), cast off the middle 6 stitches under sleeve and the sleeve cap is finished back and forth on a short circular needle. Work stocking stitch and cast off at the beginning of each row in each side as follows: 2 stitches 2-3-3-3-3-3 times and 1 stitch 4-4-5-5-5-6 times. Continue to cast off 2 stitches at the beginning of each row in each side until the piece measures approx. 52-52-52-51-51-51 cm. Cast off 3 stitches 1 time in each side and then cast off the remaining stitches. The sleeve measures approx. 53-53-53-52-52-52 cm. Work one more sleeve in the same way. Sew the shoulder seams inside the cast-off edge. Sew in the sleeves. Knit up from the right side approx. 80 to 92 stitches around the neckline (including the stitches from the thread in front) with a short circular needle size 4 mm. Work 1 round purl, 1 round knit and 1 round purl. 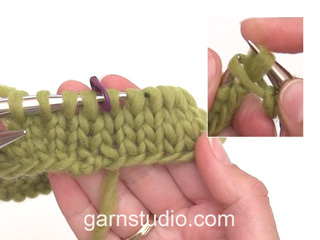 Change to short circular needle size 5 mm and cast off while working in knit on the right side.